Sometimes the simple solution is the best solution. Basic yet brilliant Venetian bead earrings to supplement any wardrobe. 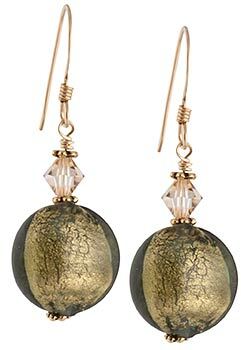 Dangling from the bottom of the gold-filled earwires are Geuine Murano glass discs of grey glass over 24kt gold foil. The earrings are further enchace by Swarovski Crystals, creating a simple yet elegant look.